I would love to read some of these stories in a longer format, as their own separate volume. I think that says a lot in itself about how much I liked this collectionThis second volume lives up to the first, or even goes beyond it in some ways. It has longer chapters (or at least that's how it feels) that result in more rounded stories; they definitely struck me more and stayed with me longer told in this format. Visually the whole volume is gorgeous, and shows a wide ranges of styles and genres. It connects to current issues in many ways, and speaks in the present tense about various cultures, even when it works with ancient traditions, which is refreshing and intriguing. I especially loved the hummingbird story, which was visually amazing, and very touching. In my opinion, this volume was stronger than the excellent Moonshot Volume 1. The creator’s roster was star studded and they created a wonderful array of indigenous stories from a variety of Nations. My favourite stories were the Anishnaabe thunderbird from Aamjiwnaang First Nation. I live a few hours from here and being Anishnaabe myself I was touched by the power of Elizabeth LaPensee’s writing and Richard Pace’s illustration. David Alexander Robertson (Cree) , Richard Van Camp (Tlicho Dene), Jeffery Veregge (S’Klallum), David Cutler ( Mi’kmaq) were my favourite contributors from the team of 30 who put these 15 stories together.Both volume 1 and 2 are incredible collections. The art, writing, colouring are all fantastic. There is so much love and care put into the production of these books and I feel as though the whole world should read them. This is an excellent collection, and I'm delighted to have backed it on Kickstarter. I hope there are more in the future. While overall, I felt the stories in the first volume were stronger as a whole, I have to say there were a few stories in this one that gutted me in a way none did the first time around.Once again, the stories, and/or the retelling of indigenous legends, were wonderful to read, if not always completely understandable by a totally white guy, at the art captured the flow and feel of the stories very well.Overall, an excellent follow-up to the first volume. I loved this even more than Volume 1 (which I also loved). There is something urgent in the stories here about, for lack of a better word in English, stewardship, and there is deep love in the stories about family and community.I hope there's a volume 3! Another stunning collection of old stories told in modern ways. Proyecto de la segunda antología Moonshot de salida estimada para principios de 2017. 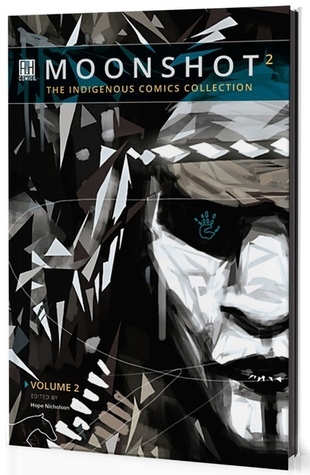 A great indigenous comics collection.